For ither uises, see Latium (disambiguation). Latium (Laitin: Lătĭŭm [ˈlatiʊ̃]) is the region o central wastren Italy in which the ceety o Roum wis foondit an grew tae be the caipital ceety o the Roman Empire. Latium wis oreeginally a smaw triangle o growthie, volcanic soil on which residit the tribe o the Latins. It wis locatit on the left bank (east an sooth) o the Tiber river, extendin northwaird tae the Anio river (a left-bank tributar o the Tiber) an sootheastwaird tae the Pomptina Palus (Pontine Marshes, nou the Pontine Fields) as far sooth as the Circeian promontory. The richt bank o the Tiber wis occupee'd bi the Etruscan ceety o Veii, an the ither borders wur occupeed bi Italic tribes. Subsequently Roum defeatit Veii an then its Italic neebours, expandin Latium tae the Apennine Muntains in the northeast an tae the opposite end o the mairsh in the sootheast. The modren stryndant, the Italian Regione o Lazio, crie Latium in Laitin an aw, an occasionally in modren Inglis, is somewha lairger still, but no as hitnle as double the oreeginal Latium. The auncient leid o the Laitins, the tribesmen who occupeed Latium, wis tae become the immediate predecessor o the Auld Laitin leid, ancestor o Laitin an the Romance leids. Latium haes played a important role in history awin tae its status as the host o the caipital ceety o Roum, at ane time the cultural an poleetical centre o the Roman Empire. Consequently, Latium is hame tae celebratit wirks o airt an airchitectur. Earliest kent Latium wis the kintra o the Latini, a tribe whose recognizit centre wis a lairge, extinct volcano, Mons Albanus ("the Alban Munt", the day's Colli Albani), 20 kilometres (12 mi) tae the southeast of Rome, 64 kilometres (40 mi) in circumference. In its center is a crater loch, Lacus Albanus (Lago Albano), oval in shape, a few km long and wide. At the top o the seicont-heichest peak (Monte Cavo) was a temple to Jupiter Latiaris, where the Latini held state functions afore their subjection tae Roum, an the Romans subsequently held releegious an state ceremonies. The last pagan temple tae be built stuid until the Middle Ages when its stane an location wur reuised for various monasteries an feenally a hotel. Durin Warld War II, the Wehrmacht turned it intae a radio station, which wis captured efter a infantry battle bi American troops in 1944, an it currently is a controversial telecommunications station surroondit bi antennae considered unsichtly bi the population athin view. The selection o Jupiter as a state god an the styrnd o the name Latini tae the name o the Laitin leid are sufficient tae identify the Laitins as a tribe o Indo-European strynd. Vergil, a major poet o the early Roman Empire, unner Augustus, derivit Latium frae the wird for "hidden" (Inglis latent) acause in a meeth Saturn, ruler o the gowden age in Latium, hid (latuisset) frae Jupiter there. The region that wad become Latium haed been hame tae settled agricultural populations syne the early Bronze Age an wis kent tae the Auncient Greeks andeven earlier tae the Mycenaean Greeks. It wis populatit bi a mixtur o Indo-European an nan-Indo-European leid speakers. The name is maist likely derivit frae the Laitin wird "latus", meanin "wide", expressin the idea o "flat land" (in contrast tae the local Sabine heich kintra) but the name mey oreeginate frae a earlier, nan Indo-European ane. The Etruscans, frae their hame region o Etrurie (modren day Tuscany) exertit a strang cultural an poleetical influence on Latium frae aboot the 8t century BC onwaird. Housomeivver, they wur unable tae assert poleetical hegemony ower the region, which wis controlled bi smaw, autonomous ceety-states in a manner roughly analogous tae the state o affairs that prevailed in Auncient Greece. Indeed, the region's cultural an geographic proximity tae the ceeties o Magna Graecia haed a strang impact upon its early history. Ane o the earliest recordit nan-Etruscan dounsets in Latium is the quasi-meethical ceety o Alba Longa locatit somewha sootheast o the present-day ceety o Roum. Accordin tae Livy an ither auncient authorities, it wis here that the Laitin League wis foondit, a coalition o ceety-states intendit as a bulwark against Etruscan expansion. The ceety-state o Roum emerged as the dominant poleetical an militar pouer in the region, follaein Roum's destruction o Alba Longa in the middle o the 7t century BC. The emperor Augustus offeecially unitit amaist aw o present-day Italy intae a single geo-poleetical entity, Italia, dividin it intae eleiven regions. Lazio – thegither wi the present region o Campanie immediately tae the sootheast o Lazio an the seat o Neapolis – became Region I.
Efter the Gothic War (535-554) an the Byzantine conquest, this region regained its freedom, acause the "Roman Duchy" became the property o the Eastren Emperor. Housomeivver, the lang wars against the barbarian Longobards weakened the region, which wis seizit bi the Roman Bishop who awready haed several properties in those territories. The strenthenin o the releegious and ecclesiastical aristocracy led tae continuous pouer struggles atween lairds an the Roman bishop till the middle o the 16t century. Pape Innocent III treed tae strengthen his awn territorial pouer, wishin tae assert his authority in the provincial admeenistrations o Tuscia, Campagna an Marittima throu the Kirk's representatives, in order to reduce the power o the Colonna faimily. Ither papes treed tae dae the same. Durin the period when the papacy residit in Avignon, Fraunce (1309–1377), the feudal lairds' pouer increased due tae the absence o the Pape frae Roum. Smaw communes, an Roum abuin aw, opposed the lairds' increasin pouer, an wi Cola di Rienzo, they treed tae present thaislves as antagonists o the ecclesiastical pouer. Housomeivver, atween 1353 an 1367, the papacy regained control o Latium an the rest o the Papal States. Frae the middle o the 16t century, the papacy poleetically unifeed Lazio wi the Papal States, so that these territories became provincial admeenistrations o St. Peter's estate; govrenors in Viterbo, in Marittima an Campagna, an in Frosinone admeenistered thaim for the papacy. Efter the short-livit Roman Republic (18t century), the region's annexation tae Fraunce bi Napoleon in Februar 1798, Latium became again pairt o the Papal States in October, 1799. On 20 September 1870 the capture o Roum, durin the reign o Pape Pius IX, an Fraunce's defeat at Sedan, completit Italian unification, an Lazio wis incorporatit intae the Kinrick o Italy. Latium, aften referred tae by the Italian name Lazio, is a govrenment region, i.e. ane o the first-level admeenistrative diveesions o the state. 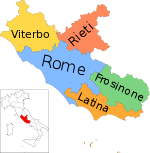 Thare are twinty regions in Italy. Oreeginally meant as admeenistrative destricts o the central state, the regions acquired a significant level o autonomy follaein a constitutional reform in 2001. The modren region o Latium conteens the naitional caipital Roum. ↑ Cary, M.; Scullard, H. H. (1975). A History of Rome: Down to the Reign of Constantine (3rd ed.). New York: St. Martin's Press. p. 31. ISBN 0312383959. Behncke, Boros (1996–2003). "Colli Albani or Alban Hills volcanic complex, Latium, Italy". Italy's Volcanoes: The Cradle o Volcanology. Retrieved 28 January 2010. This page wis last eeditit on 18 Dizember 2013, at 18:29.